This is nice! It is a vintage 1940's era RP showing an old view of a main street type area of Blythe California. Vintage 40's autos and delivery trucks line the shopping district. To the right is the old Blythe Drug Co building. Signs read "The Rexall Store", "Cooled Refridgeration", "Liberty Theatre", "Minermans Department Store This Way", "Liberty Barber Shop Baths", "Greyhound Bus Depot", "Rt 70", "Coca Cola", "Cafe". An old delivery truck reads "Housum" on its side and back doors. In view are Richfield, Texaco and Chevron gas stations with several pumps in view and a sign that reads "Guest Rooms". To the extreme left is a "Beauty Shop". Card front is printed "Blythe , California". Back of card is divided and postally unused with an "E K C" Stamp Box. Also is printed "Lollesgard Specialty Co., Tucson Arizona". Condition-Excellent as shown. #162 RP San Diego Hotel 1925 ! Here is a nice old view. Image pictures a 4 passenger Oldsmobile Coupe outside the gate of an old hotel (identified by writer as San Diego Hotel). The sign reads "Studio Stables Horses For Hire". Back is handwritten and dated April 9 1925, but unsent. Condition is excellent! 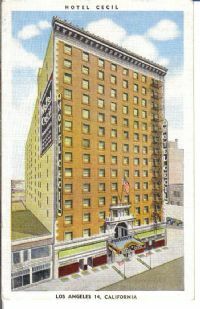 This is a nice old linen era card picturing the Hotel Cecil at 7th and Main Street in LA. Back is divided and postally unused. Reverse also has hotel details for this 1940's hotel. Condition is near mint. #58 RP El Centro CA w/ Autos!!! Here is a super California Real Photo Main Street view! Its taken back in 1943, looking down Main St in El Centro Cal. There are lots of vintage 30's and 40's auto out in front of the stores. Easily seen are drug stores, hotels etc. Back is postmarked "El Centro Calif. Apr. 8 1943". A great image!